Eligible Mercury I.Q. Certified Boat Builder models sold to US and Canada residents will receive 5 years coverage (2 years of Mercury Limited Warranty and 3 years of Mercury Power of Protection Limited Warranty). Valid on boats purchased from July 2, 2017 to July 1, 2018 and registered by July 16, 2018. The information provided in this document is intended to provide only a brief description of the benefits of this Mercury 5-Year Gas Sterndrive and Inboard Engine Limited Warranty. 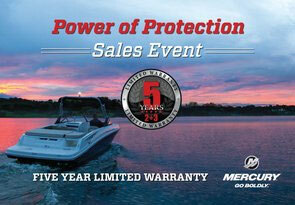 This Mercury Limited Warranty also has exclusions and limitations that apply to the benefits discussed in this document. For complete details as provided in the Agreement document (including “What is not Covered”), please call the program administrator at 866.404.3064.